A Place for Conversation was created in partnership with Newport Primary School to make a space for parents, teachers and students to reflect on where they feel they belong in terms of culture, identity, heritage and home. Through art making workshops and discussions, parents were initially asked to think about one story they would like to pass on to their children. 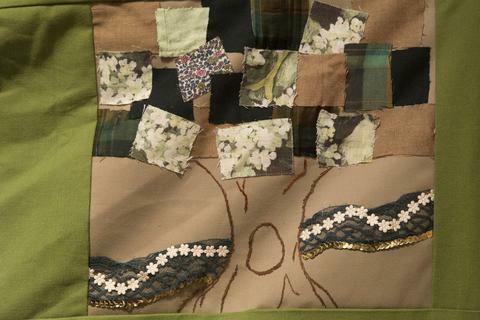 These stories were then visually represented through textile fabrics and made into samplers (quilt squares). Students and teachers were also asked to create samplers which explore heritage through an event like the Olympics or the World Cup. 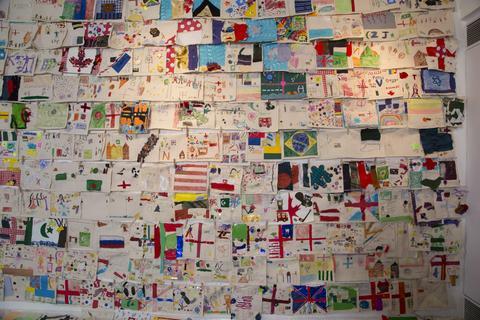 Through this process both groups have made representative flags, which have been added to the parents samplers to create a large school collective quilt. 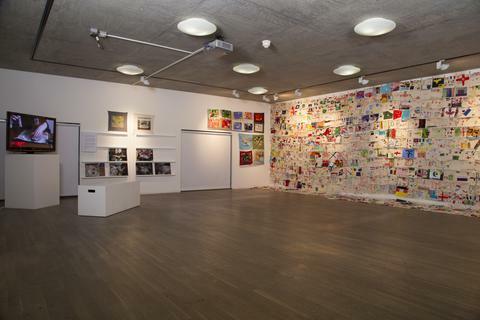 To see the results visit our on-line gallery of the collaborative works made as seen at an exhibition at Rivington Place in July 2014. A Place for Conversation was delivered in schools during 2014. The programme was designed by Lyn French and delivered by the artist Aya Haidar, whose artwork ‘Peregrination’ found within ‘Who are you? Where are you going? served as a starting point. In ‘Peregrination’ Aya Haidar has sewn a map on the inside of each of a pair of shoes. If worn, the maps would be hidden from sight. This suggests that we all take personal journeys that are known only to us. The threads outlining the maps lace across from one shoe to the other, joining them together. The artist may be conveying what it feels like to be connected to more than one country and to have a mixed heritage. We find out who we are by exploring our family stories and sharing them with others and discover our purpose and where we are going in life through identifying what is most important to us. The students, teachers and parents participating in A Place for Conversation explored themes relating to heritage and personal life stories and trajectories by making art relating to their identity, cultural background and family history. Aya Haidar is a Lebanese multimedia artist whose work focuses on the use of found and recycled objects in order to create poetic works exploring loss, migration and memory. Her most recent solo exhibitions, titled Year of Issue(2014) and Behind Closed Doors (2011) were shown at the New Art Exchange, Nottingham and Bischoff Weiss Gallery, London, respectively. Her most recent group shows, Stitching Cyborgs (2014) featured works exhibited at Contemporary Arts Platform, Kuwait and A’Rebours (2014) at Bischoff Weiss Gallery, London. She has also participated in various international art fairs, namely FIAC (2009), Art Dubai (2011, 2012, 2013), MENASA (2013) and Art Istanbul (2013).